Have we talked about how I love breakfast foods? At the moment I am in Illinois visiting some family. This means grandma cooks breakfast almost every morning. 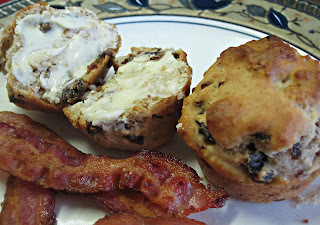 We've enjoyed pancakes, sausage, french toast, eggs, bacon, and this morning raisin muffins. My grandmother pulled out her ancient Betty Crocker cookbook and copied the recipe for me so that I could share it with you! Preheat oven to 400*. In one bowl cream together butter and sugar, beat in the egg and milk. In a separate bowl combine flour, baking powder, salt, and cinnamon. Combine dry ingredients into wet ingredients a little bit at a time, mixing thoroughly- fold in the raisins. 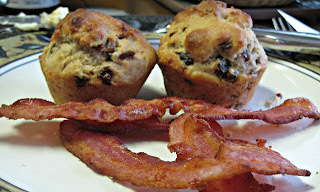 Bake in greased muffin tins for 20-25mins or until golden brown. Makes 12 medium sized muffins. 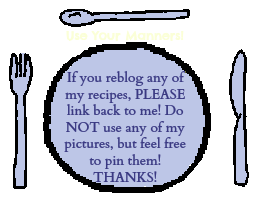 -Note from the eater of these muffins- I ate mine with butter, but without butter they were a tad dry, baking time may need to be shortened so watch them! As my great grandmother would say "you can't cook if you're not in the kitchen!" Also, these are NOT sweet muffins, not not not not- if you're looking for super sweet, you'll need to increase the sugar to 1/2 cup and reduce the flour to 1.5 cups. If you find yourself without one of the ingredients check out my post on Baking Substitutes.